FT Synthetics HYDRA is a breathable synthetic roofing underlayment designed to add an extra layer of protection from water penetrating your roof, and at the same time help the release of trapped moisture due to poor attic ventilation. HYDRA is designed with an internal monolithic membrane. This structure provides outstanding vapor permeability using an advanced chemical transfer of water vapor and acts as a liquid water barrier under all weather conditions. 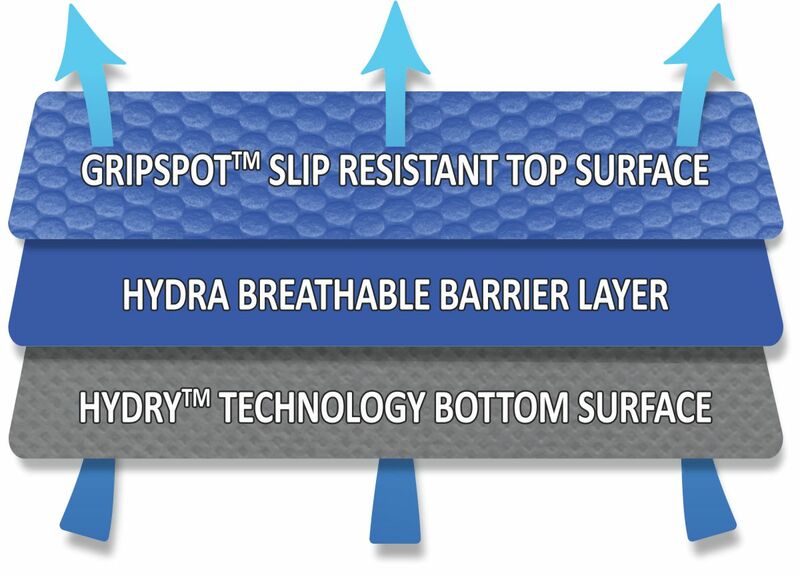 HYDRA includes our slip resistant GRIPSPOT™ technology top surface for superior walkability and HYDRY™ technology for faster roof deck drying. HYDRA now features our exclusive HYDRY™ technology designed to tackle the problem of water on the roof deck during installation. Non-breathable synthetic roofing underlayments will trap liquid water on a roof deck which can quickly lead to mold growth and possible roof deck rot. Other breathable roof underlayments don’t perform much better and are slow to move liquid water from the deck. HYDRY technology quickly absorbs water from the deck and transfers it at a rate 15 times the leading breathable synthetic underlayment in the market and 10 times traditional #30 felt. Use: FT Synthetics products are a secondary layer protection approved for installation over plywood with proper fasteners on roof slopes 2:12 and greater. Product is a secondary barrier under a primary roofing product such as asphalt shingles, synthetic shingles, metal, tiles, slate, and cedar shakes. Preparation: Before installing the underlayment ensure that the roof is dry and clear of any debris or any sharp protrusions. Installation: FT Synthetics underlayment is laid out horizontally with printed side up using 4” horizontal laps and 6” vertical laps. For prolonged exposure where driving rain or bwinds are expected it is recommended to double the overlaps. For low slope applications between 2:12 to 4:12, it is recommended to overlap 50% plus 1”. Fastening: FT Synthetics underlayment should be installed with plastic or metal (ring shank or smooth shank) cap-nails or cap-staples. Un-capped staples or standard roofing nails may be used if the primary roofing material is installed within 48 hours (unless rain or high winds are expected). Use of un‑capped fasteners may result in a possibility of blow off or leakage around the fasteners. Exposure: For short term coverage (48 hours) underlayment can be fastened using every other anchoring position as printed on the product. For extended exposure fasten the product using every anchoring position as printed on the product. All anchoring must be performed flush to the roof, 90 degrees to the roof deck that will hold the material tightly with the plywood. Product has 180 Days UV protection, but it should not be considered a final roofing system. A proper final roofing system should be installed over the product to get the proper protection. FT Synthetics products are designed with the GRIPSPOT technology for better skid protection for the roofer but product may become slippery due to high moisture, frost, rain, water, dust, debris or other conditions. Use precautions when working on the roof. Follow all local and federal safety codes when installing any roofing system including FT Synthetics products. Failure to adhere to those procedures may result in serious injury or even death. Copyright All Rights Reserved © 2014 FT Synthetics Inc. Need more information? Send us an email and we'll get back to you, asap. I consent to FT Synthetics collecting my details through this form.